The Ford Focus ST goes on sale in the United States in 2012. PARIS -- Ford Motor Co. last week unveiled a five-door hatchback performance version of the Ford Focus compact, which will go on sale in the United States in 2012. Also at the auto show here, Ford showed the production version of the redesigned 2012 Focus, which goes on sale in the United States in early 2011. The 2012 Focus comes in two body styles: a four-door sedan and a five-door hatchback. 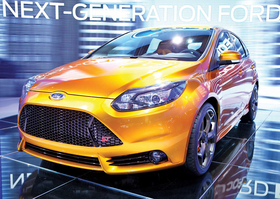 The performance version, called the ST, is expected to achieve more than 240 hp. The redesigned Focus will offer features found in larger, more expensive vehicles because Ford has found that an increasing number of buyers are coming from those segments to smaller cars. For example, most buyers of Ford's new Fiesta subcompact are moving from larger vehicles. About 20 percent of U.S. Fiesta sales are for cars featuring items such as leather seats, said Jim Farley, Ford's group vice president of global marketing, sales and service. Ford has not announced pricing on the Focus, which will compete with the Chevrolet Cruze, Honda Civic, Toyota Corolla and Volkswagen Golf. The base 2011 Focus sedan starts at $17,365, including shipping. Ford is launching a major social media marketing campaign for the Focus. The company is working directly with Facebook to select 100 people from around the world to come to Europe and test drive the car early next year. Those people then will write or produce videos about the car on Facebook.